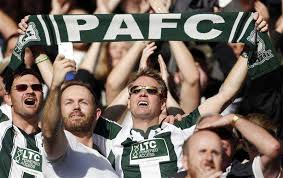 It’s true there are a lot of long trips up North this season for Argyle but there are still a few highlights for us Argyle fans in the fixture list. Top of the list are the two genuine London games against Wimbledon on 21 Oct and a welcome return to the Valley to play Charlton on 24 March. There’s also some very handy games within 100 miles at Peterborough, Southend, MK Dons, Northampton, Oxford and Gillingham on the last day of the season. We look forward to seeing you at some of these games and do look out for PASALB committee members at Peterborough and Southend where we will be there to help you sort out your membership for the new season.